Antibodies are Y-shaped molecules produced by the immune system’s plasma cells that have the ability to neutralize toxins and pathogens like bacteria or viruses. They were originally described in the late 1800s as the active component of antiserum and a key component of most types of immune response. In the 1970s, scientists developed techniques to produce antibodies outside the body—and in vast quantities. “They are considered ideal research and diagnostic tools to study or detect underlying pathological conditions,” said Ann Black, founder of ImmunoReagents, Inc.
Black worked for almost two decades in antibody development, purification and immunoassay development for companies like drug giant Boerhinger Mannheim before she decided to strike out on her own. She was in charge of antibody development and procurement at its Indianapolis facility. She later made a career move to Fortron Bioscience, a developer and manufacturer of polyclonal antibodies, antigens and other biological reagents, to become vice president of research and manufacturing. In 2005, when Fortron decided to sell the company, Black decided to take the entrepreneurial plunge and launch her own company — ImmunoReagents. Ann Black, right, founded ImmunoReagents in 2005. 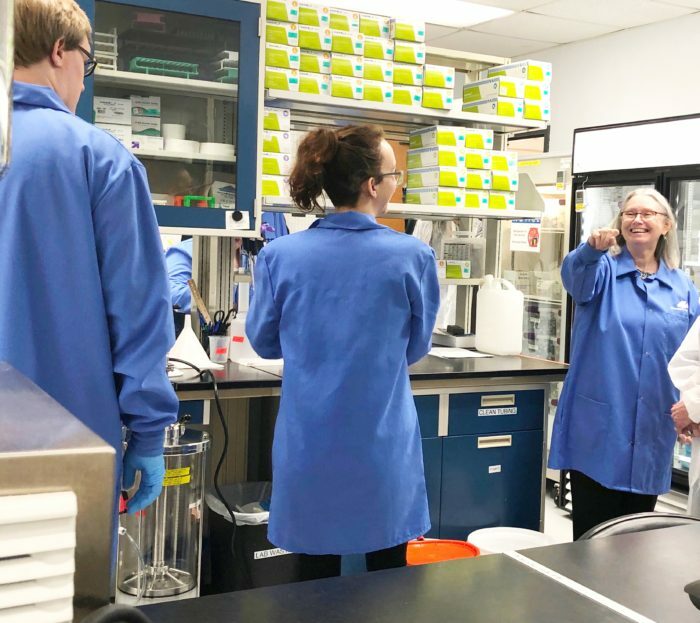 Since 2014, the EDPNC has been an important part of the Raleigh biotech manufacturer’s growth in to a global exporter of antibodies and reagents used in research and in-vitro diagnostics. With those capabilities in place, the company then branched into the immunodiagnostic market, manufacturing primary antibodies to be used in diagnostic kits for the detection of a variety of human diseases. Business was good, selling mostly to U.S.-based universities and organizations in the life sciences market. That all changed when she met John Loyack at the 2014 BIO International Convention. Loyack is vice president of global business services at the Economic Development Partnership of North Carolina (EDPNC), which is part of the North Carolina Manufacturing Extension Partnership (NCMEP). Black and Loyack struck up a conversation about services the EDPNC offered North Carolina companies interested in entering global markets. Black discovered the EDPNC could help her company in a number of areas, including trade show assistance, market entry strategy, advocacy and more. As a growing company, ImmunoReagents moved quickly and applied for federal State Trade Expansion Program funding administered by the EDPNC in North Carolina. The grants offset company costs of participating in certain international trade shows. 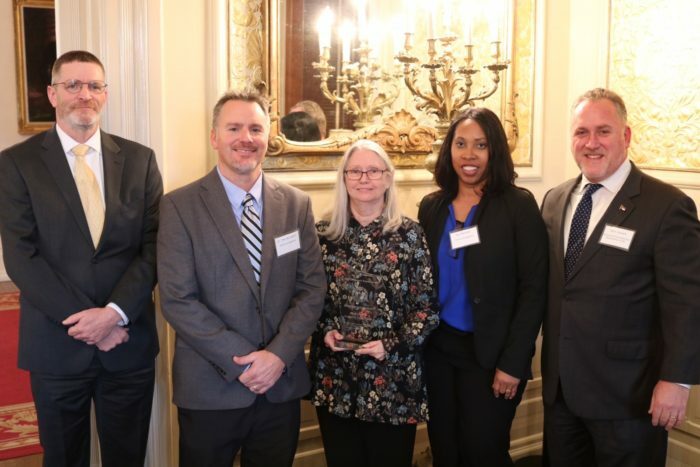 ImmunoReagents founder Ann Black, center, and her staff with EDPNC International Trade Manager Mike Hubbard, far left, and EDPNC Vice President of Global Business Services, far right, at the Executive Mansion ceremony for the 2018 Governor’s Export Awards. The EDPNC helped ImmunoReagents grow its global sales by connecting it to major international trade shows, foreign distributors for their products and more. Between 2011 and 2014, the percentage of the company’s revenue attributable to international sales grew from 3 percent to 30 percent. ImmunoReagents began with only six products in 2005. Today, the organization offers more than 2,000 products to the research and diagnostic marketplace. Regional distributors offer these products not only in the U.S. and Canada, but also in 22 countries in Europe, Asia and Australia. Black was recently recognized with the 2018 North Carolina Governor’s Export Award. The program recognizes North Carolina companies for international export growth and honors those whose products and ideas represent the state’s strong business reputation around the world. In 2015, the U.S. Secretary of Commerce presented ImmunoReagents with the President’s “E” Award for Exports, the highest recognition any U.S. entity can receive for making a significant contribution to the expansion of U.S. exports. This is an abbreviated version of an article written by Teresa Bradford, director of marketing at the North Carolina Manufacturing Extension Partnership (NCMEP) and NC State Industry Expansion Solutions. Click here for the full article, which originally appeared on NCMEP’s website and is republished here with permission. NCMEP is the official representative of the MEP National Network ™ and NIST MEP in North Carolina. The MEP National Network is a unique public-private partnership that delivers comprehensive, proven solutions to U.S. manufacturers, fueling growth and advancing U.S. manufacturing. North Carolina businesses can connect to a variety of free resources to help them increase their foreign sales. For more information, contact EDPNC International Trade Director Mike Hubbard at 919.447.7757 or mike.hubbard@edpnc.com.